Like all other devices in our product range, Basic Panels 2nd Generation offer proven SIMATIC quality and, regardless of display size, numerous software functions as standard – for example, alarm logging, recipe management, trend functions and language switching. SIMATIC HMI Basic Panels 2nd Generation can be configured via SIMATIC WinCC (TIA Portal) in the cost-efficient Basic Edition which already offers the outstanding Usability and unprecedented engineering efficiency of the Engineering Framework. The user can easily create visualization applications within short time. As the software is scalable, he can start with a small solution and further expand it any time as required – for example by increasing the number of tags or change to panels of another performance range. improved process visualization. The displays’ brightness is dimmable up to 100 %, offering optimum flexibility. The new innovative user interface provides a great variety in terms of experiencing and operation. 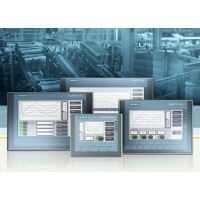 The new SIMATIC HMI Basic Panels feature user-friendly touch screens and particularly handy, freely configurable keys.. Installation compatibility with SIMATIC HMI Comfort Panels and existing SIMATIC HMI Basic Panels 4" and 6"
Which connector cables are available for connecting to SIMATIC Panels?